After the release of their debut album „Dreams and Doubts and Fears“ in 2014 the Dortmund/Germany based electropop band „Rroyce“ returns with their second album „Karoshi“ in a special „Deluxe“ edition. „Karoshi“ is a japanese term for death by a sacrifice job. The idea for the album title was born during the production progress of the album while the band members often had to find a middle way in between the love for the music, being private family men and their own dayly job routine. „Karoshi“ is also an album which has some strong social messages against homophobia, violence against foreigners and immigrants. The album cover was designed by Irene Berbee a well known coming designer. The Deluxe version of „Karoshi“ features massive six (!) bonus tracks starting with some acoustic version of „The Dying of your Pride“ and „The Principle of Grace“ which give you goose bumps while listening, followed by four massive remixes from well known bands such as „Eisfabrik“, „Rotersand“, „Beborn Beton“ or „Neuroticfish“ who gave the songs their very own brand. 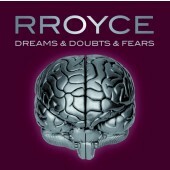 „Rroyce“ are a new bright light in the long row of high quality synth- and electropop bands coming from germany.